What we have here is a simple publisher publishing an OrderPlaced event and a subscriber which handles the orders when the events are published. I have seen this pattern being used in many code bases and is pretty much the standard way of writing pub-sub applications in the enterprise. However, there are a couple of things that I do not like about this approach. We also have to worry about NewOrder delegate not being null and making sure there is at least one subscriber before publishing. There are many ways to make that part cleaner (specially in C# 6) but why do this when we can do better! So how can we improve what we currently have? 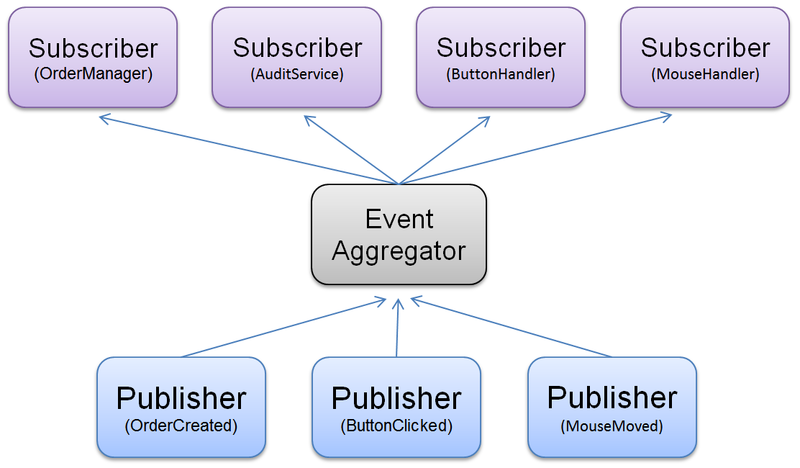 An Event Aggregator is a service which sits between your publishers and subscribers acting as an intermediary pushing your messages (events) from one entity to another. So what this means is that your publishers and subscribers are no longer coupled together and they only need to hold a reference to the Event Aggregator. But they either lacked the optimal performance or the kind of API I was hoping for; So I came up with the Easy.MessageHub. The API surface-area is very simple, there is the MessageHub representing the EventAggregator which is implemented as a singleton and can be registered as an IMessageHub using your favourite IOC framework and injected in your publishers, subscribers or anyone else who might be interested in the messages coming in or going out. There is also the concept of global event handler allowing you to have a single hook into every message that is published by the hub perhaps for the purpose of logging, audit etc. Publishers and Subscribers no longer hold a reference to each other therefore reducing coupling. We do not need to check if the publisher has any subscribers before publishing, we just fire the message and the MessageHub takes care of the rest. The source together with some benchmarking and usage examples are available on GitHub and NuGet package available HERE.